iW-RainboW-G12M-Q7 is Qseven R1.20 compatible module powered by TI Sitara AM389x ARM Cortex A8 CPU running at 1.5GHz and offers multiple high performance interfaces such as DDR3, PCIe Gen2, SATA2.0. The module supports on-board 1GB DDR3 RAM, NAND Flash and Micro SD card. 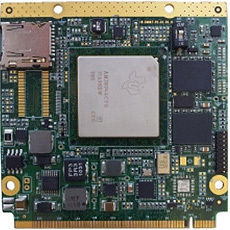 With extreme peripheral integration, the module is ideal solution for high performance embedded computing applications.